You may want to keep this simple blueprint for soup affixed to the inside of cabinet door, just as a reminder for those nights when you think there’s nothing to scrounge for supper. Bear in mind, if you happen to have vegetables on hand aside from what the recipe calls for, you may as well toss them in, too. Swiss chard? Potatoes. Sure! Conversely, an error of omission isn’t the end of the world. No celery? No worries. See how easy that is? Not to mention satiating–far more so than a bowl of cold cereal. So look in your pantry again. Dinner’s in there. You just have to know where to look. 1. To make the Smoked Paprika and Chickpea Soup in your slow cooker, see the Slow Cooker Variation below. To make the Smoked Paprika and Chickpea Soup on your stovetop, heat the olive oil in a large, heavy-bottomed pot over medium heat and add the onion, garlic, celery, and rosemary. Sauté for a few minutes until the vegetables and aromatics begin to soften, 5 to 7 minutes. 2. Add the chickpeas, smoked paprika, bay leaves, tomato paste, and canned tomatoes to the pot and bring to a gentle boil. Add the water, season, and return to a boil. Lower the heat and simmer for 10 minutes. 3. Discard the bay leaves. Let the soup cool slightly and then process about half the mixture in a blender or with an immersion blender. Stir the purée back into the soup in the pot. Taste and adjust the seasoning accordingly. Reheat gently, if needed, and stir in the parsley. Ladle into warm bowls. Wouldn’t you know it? The simplest of soups becomes even simpler when made in a slow cooker. Follow step 1 of the instructions above, omitting the rosemary. Transfer the sautéed veggies to a slow cooker and stir in the tomato paste. Then add the chickpeas (we used canned chickpeas), paprika, bay leaves, diced tomatoes and their juice, water, salt, and pepper, and the sprig whole of rosemary (don’t worry, you can fish it out later). Cook on high for 3 to 4 hours or on low for 8 hours. Discard the bay leaves and rosemary. Ladle the soup into bowls and sprinkle with the parsley. 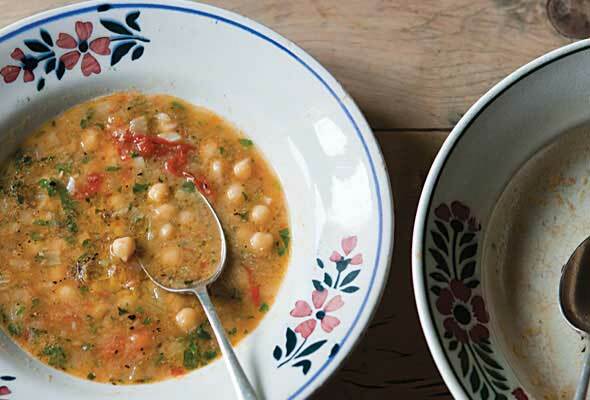 Smoked Paprika and Chickpea Soup Recipe © 2010 Tamasin Day-Lewis. Photo © 2010 James Merrell. All rights reserved. All recipes and photos used with permission of the publisher. You had me at chickpeas and smoked paprika. As someone who’ll eat chickpeas straight out of the can as a snack, I’m a little biased, but this soup was fantastic—not just for its sheer yummiosity, but for the fact that dinner was made in the time it takes for water to boil. All of the ingredients were on-hand, and nothing weird had to be purchased (although, depending on where you live, the smoked paprika might be hard to find). I wouldn’t recommend switching it out for the non-smoked variety, as the flavor wouldn’t be right. But if you can’t find smoked paprika, adobo sauce from a can of chipotles might just do the trick. Pureeing half of the soup and adding it back into the mix gave it a great, hearty texture, but if you’re looking for lighter fare, the soup is also quite nice before processing. The recipe made a good amount, at least enough for 6 healthy servings. I even ate it chilled (with a much-improved flavor). I’d most certainly make this again. I made this in my slow cooker and it turned out great. I used canned chickpeas and I cooked it on high for 3 1/2 hours. I left the sprig of rosemary whole so I could remove it before serving. We loved it and, because we have leftovers, I ate it for a few days. I adapted this for the slow cooker and used canned beans as they can stand up to the time taken by a slow cooker. The one thing I have learned with this kind of slow cooking is the spices disappear, so I doubled the amount of smoked paprika. It definitely made a much richer tasting soup. I also put my rosemary in whole and the removed it at the end, as I find when it’s chopped and cooked for a long time I don’t like the texture it leaves behind. I also finished the soup with cilantro instead of parsley and a squeeze of lemon to brighten it. It was incredibly tasty and have been eating the leftovers for days. This is a delicious soup, and so easy to convert to a slow-cooker, although my soup turned out like more of a tomato soup rather than the broth-based soup that appears in the photo with this recipe. This soup could easily be transformed into a minestrone by adding a cup of diced zucchini to the celery-onion combination and adding a cup of cooked orzo or ditalini to the soup right before serving. I would also refrain from blending half your cooked soup, as the recipe suggests; the chickpeas are much tastier in whole form. I cooked my soup on low for 8 hours and had soft but not mushy chickpeas and deep, complex flavors. This makes a wonderfully flavorful soup that fills the kitchen with a great aroma and a hint of the goodness to come. I didn't saute the vegetables first, and when I make it again I'll do that before I put everything into the slow cooker. I think that the flavors would develop to a much deeper level if the vegetables are sauteed first. This was so good that we forgot to purée some of it first—we tasted it and then just dug in! Today we puréed half of what was left and found that It was even better, if that is possible! Very nice. I like the idea of pureeing half of the cooked chickpeas and leaving the rest chunky. It’s definitely a chickpea trend! Janet, your recipes look great. This sounds delicious! I’m sure it would be great either way, but did you use hot or sweet smoked paprika? Thanks, David. That’s what I used and the soup was delicious. Instead of water I used the chickpea cooking liquid (which had gelled, just like meat stock). I forgot to pick up the herbs, so I finished mine with cilantro and queso fresco. Tomorrow’s bowl will feature a poached egg–thanks Mary-Alice! I’ve been sick as a dog all week, and I’ve made this twice and it has been perfect. Super quick and easy, even when you don’t feel like cooking. The epitome of comfort food, aojjoa. Get well soon! We make a version of this using Spanish chorizo and spinach. We also put a fried egg on top to thicken the soup. Very good and very filling. Sounds great. Is the yolk of the egg runny? This will be a quick dinner this week. Thanks! I made this last night and it was oh so comforting! I added some sweet potato chunks and topped the soup with a dollop of greek yogurt, a drizzle of olive oil, and some cracked pepper. Mary-Alice, I’ll be putting a poached egg on my leftovers today! We made this last Friday as a wonderful meatless dinner for Lent. I was out of smoked paprika (this caused a frenzied cleaning out of the entire spice cabinet to find it, so there was an upside),and the celery was not as youthful as I would have liked. So we used a white potato and sweet paprika, and dried rosemary. It was FANTASTIC!! I am really looking forward to making it again, this time as written, so I can get that wonderful smoky sensation I’m sure we were missing. My husband made homemade rosemary bread to go with it–it was a wonderful meal!! Oh–suggestion to maybe use petite diced tomatoes instead of regular diced. I just thought the chunks of tomato were a bit too big. But it could have been the brand I had. Lizaanne, wow! It’s hard to make Lenten food sound appetizing, but you sure did. I love the substitutions you made. You’ll make Renee–the queen of kitchen improv–very proud. Not sure how it works, but it does! Wrap stalk of celery in aluminum foil- yes, the whole stalk- and then store in refrigerator or cool place. Your celery will stay fresh for up to a month! No more limpy celery when you want to make soup! This is a GREAT recipe. I have made it 3 times since you posted it. I add a can of drained rinsed white beans, like cannelini or great northern, at the same time as I add the chickpeas. They add some luscious creaminess to the immersion-blending. Also I ladle the soup over a little heap of chopped steamed kale and top with parmaggiano and the parsley. Thank you for the deliciousness! Glad you love the soup Cassandra. Nice, hearty variations, too! We made this for dinner last night and LOVED it! We cook our chickpeas from scratch to make hummus, and so we used the leftover broth as stock rather than water, and added some Parmesan rinds we had on hand. We also put fresh spinach leaves in the bottom of the soup bowl and ladled hot soup over it. It was just perfect for dinner on a cool, grey, spring evening. Thanks for sharing this! It’s definitely going into my arsenal of recipes. this was really good… the smoked paprika makes it special! even better the next day! personal preference-i took someones suggestion and pureed 1/3 to add some body to the soup. by the way, the gluten free banana bread was awesome!!!!! Susan, 1.) glad you liked it, 2.) great idea., 3.) thank you., 4.) ditto. Not only did I love how this turned out but I loved how quickly it came together. I used my own broth, canned chickpeas, cubed butternut squash, and a few zucchini to increase the veggie content. I also pureed 1/3 of the veggies which made it feel a lot more hearty. The whole thing was done in 20 minutes. Yum! We couldn’t agree more, Amy! We have to ‘fess, we have a crush on Tamasin Day-Lewis, every recipe she creates just seems to end up dog-eared–and doggone good. And we, too, love when you can tweak a recipe to make it your own. Really yummy, made a couple of adjustments. I cut back the tomatoes to about 60% of what the recipe called for. Used more liquid, 50/50 chicken broth to water. Also used a touch more rosemary (love the stuff), doubled the garlic (also love! ), and cooked for 30 minutes+ to ensure the flavors melded well, before a minute with an immersion blender (still plenty of whole garbanzos remain.) Delish with toasted ciabatta bread drizzled with EVOO. Paula, so glad you liked the recipe. I think your changes sound great–people take note! We made this twice and loved it! It was so easy to throw together and very tasty. Using other readers’ suggestions, we pureed half the soup, which gave it great texture. The second time, we made it in the slow cooker. Unfortunately I didn’t think ahead of time to reduce the water, so the soup was a little runny, but other than that still good. Lovely to hear, Sara. Lovely. This is our default pantry supper, and sounds like it is for you, too. Appreciate the slow-cooker advice…how much water would you suggest using? I’d probably reduce it by half and add more at the end if you want it thinner. I just realized cooking time would probably be very helpful ;) I cooked it for 6 hours on low. I didn’t get home until a couple hours after it was done, but it was still good after being on my crock pot’s keep warm setting for an additional two hours. Made this tonight for my ailing daughter and it was wonderful for both the sick and the well. We both enjoyed the seasoning and consistency of the soup that made it rustic in flavor. I served Parmesan toast points by Ina Garten along with it, and they added a nice crunch. The soup was both really tasty and easy, making it the perfect meal. Cleo, we’re sorry to hear that your daughter isn’t feeling well, but much relieved to know that this soup brought some measure of comfort to you both. 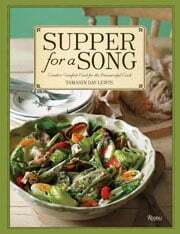 It’s one of our favorites, evidenced by all the comments you see above, although we’ve never gone wrong with a recipe by Tamasin Day-Lewis. Many, many thanks for sharing this with us. Using the slowcooker version. Should i still puree half and add it back to the batch or is that only for stove stop version? It’s up to you, Marissa. Just depends on the final consistency you prefer. Let us know what you decide…. My boyfriend and I looooove this soup. About to make it for the third time so I figured I would leave a note in thanks. I follow the stovetop recipe closely and it’s great as is! I don’t like rosemary much, so I just soak a couple of stems with the leaves and remove them with the bay leaves. I also don’t remove the celery strings because we don’t notice a difference. Thanks for a great recipe!! Tamasin Day-Lewis certainly knows her way around a soup recipe, doesn’t she, Alyse? Lovely to hear that you’re as smitten with this soup as we are. This looks so good. I had everything to make the soup…so I just put it all together in my crock pot. I can’t wait to try it this afternoon! Swell, Deebee, many thanks for taking the time to drop us a note. We can’t wait to hear what you think! I loved this recipe and will definitely use it again! It had all the perfect flavors of a vegetable soup, and I loved that it called for water instead of broth like most recipes (the water made it lighter and not overly salty). I added a potato because I had one that I wanted to use. I’ve made other vegetable soup recipes before but they’ve generally been disappointing and bland. This one was not! I added some chili flakes for extra spice and it was yummy like that.